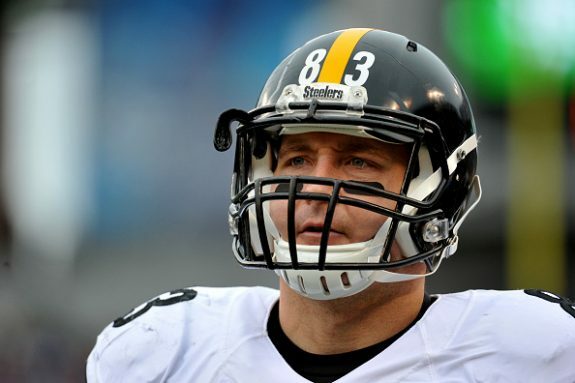 In a move that sent shock waves through the Steelers on Friday, tight end Heath Miller today announced his retirement after playing 11 seasons with the team. Miller, the firs-round pick of the black and gold during their Super Bowl season in 2005, leaves the team as the best tight end in Steelers history. He played in 168 regular-season games, the most by a tight end in team history, and ends as the Steelers’ all-time leader in receptions (592), receiving yards (6,569) and touchdowns (45) by a tight end. Overall, Miller ranks second in career receptions, fourth in receiving yards and receiving touchdowns, and sixth in scrimmage yards (6,577) and is one of four players to record 500 receptions. 3 Comments on "Tight End Heath Miller Announces Retirement From Steelers After 11 Seasons"
Heath was hands down the best tight end in Steelers history and his career statistics back that up . With that being said , Heath could have been so much more to the Steelers during his career if he hadnt played for coordinators that believed in using him more as a blocker than a pass receiver . Heath had excellent hands but rarely was allowed to use them . At the end of the day , its the Steelers loss , in more ways than one . A true professional in every sense of the word . He will be missed . Amen, DaveB. To get some perspective on how under-utilized Miller was, consider what Seattle, Green Bay, or New England would have done with him. Miller’s stats simply do not reflect his value to the Steelers or the rarity of his athletic talents. He is just one of several fine athletes that the Steelers coaching staff has failed to use properly. For Miller’s own sake, I am glad he is retiring while he is still healthy. There is more to life than football.